2016 is the Year of Mercy and Pope Francis has called us to "put the Sacrament of Reconciliation at the center once more." 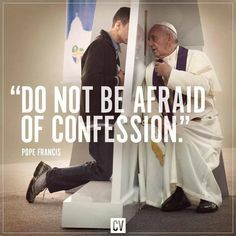 Here are the teachings of the Popes and of the Catechism on (1) the central importance of Confession and (2) the strong recommendation of the Church for frequent Confession. Joins us with God in intimate friendship. The whole power of the sacrament of Penance consists in restoring us to God’s grace and joining us with him in an intimate friendship” (CCC 1468).